Notre Dame BRYAN RUST (21), the NHL prospect whose 32 points (15 goals) are second on the Fighting Irish this season, is pursued by Bowling Green right wing ADAM BERKLE (13), the undrafted sophomore from Collegesville, Pennsylvania, during the Central Collegiate Hockey Association quarterfinal playoff round at the Compton Family Ice Arena in South Bend, Indiana. 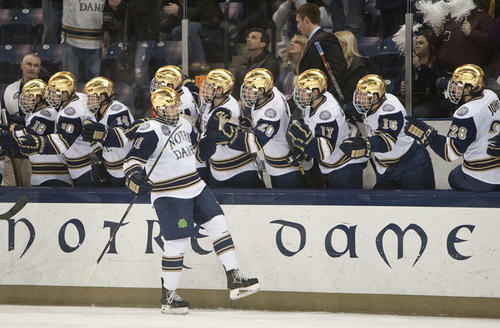 Timely goal-scoring from BRYAN RUST and competent goaltending from STEVEN SUMMERHAYS powered hopeful NOTRE DAME to a two-game sweep of visiting BOWLING GREEN in the quarterfinals of the last-ever Central Collegiate Hockey Association playoff tournament. Bowling Green’s senior Canadian legionnaire ANDREW HAMMOND, the undrafted 25-year-old by way of Surrey, British Columbia, stopped all 35 Notre Dame shots in regulation on Friday night but the Fighting Irish prevailed when Rust, the 20-year-old junior from Novi, Michigan, who was the third round pick (# 80 overall) of the Pittsburgh Penguins at the 2010 National Hockey League Draft, scored just 1:22 into the overtime session. Rust also found the back of the net for Notre Dame less than seven minutes into Saturday night’s tilt with the visitors from neighboring Ohio. Left wing NICK LARSON, the senior from Apple Valley, Minnesota, who was the fourth round choice (# 108 overall) of the Calgary Flames at the 2008 NHL Draft, added a second goal for the Fighting Irish before Bowling Green made a concentrated effort to get back into the series. Canadian legionnaire BRYCE WILLIAMSON, the junior right wing from Seba Beach, Alberta, and left wing BEN MURPHY, the 21-year-old freshman from Duxbury, Massachusetts, each scored goals to bring the Falcons level by the end of the second period. 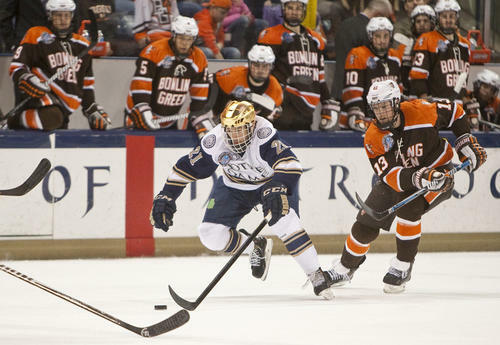 Bowling Green left wing DAN DESALVO (11), the productive little sophomore from Rolling Meadows, Illinois, who finished second in scoring for the Falcons with 25 points (5 goals) in 41 games this season, is denied by the outstretched left skate of Notre Dame goaltender STEVEN SUMMERHAYS (1), the junior from Anchorage, Alaska, who has appeared in 33 games (1.99 avg, .921 svpct) for the Fighting Irish this term, during the CCHA quarterfinal playoff series at the Compton Family Ice Arena in South Bend. Rust, however, notched his third goal of this CCHA quarterfinal playoff series for the Fighting Irish on a penalty shot eight and a half minutes into the final period. And center ANDERS LEE, the junior from Edina, Minnesota, who was tabbed in the sixth round of the 2009 NHL Draft by the New York Islanders, added a critical insurance marker for Notre Dame three and a half minutes later. It is the experienced Lee, to review, who tops the Fighting Irish with both 19 goals and 37 points this season. A second goal of the night from Williamson brought Bowling Green to within 4-3 but would not save the Falcons, who concluded this 2012/13 NCAA campaign with a record of 15 wins against 21 losses with five ties, from elimination. Notre Dame, meanwhile, improved its slate this term to 23 wins against a dozen setbacks with three ties. The Fighting Irish also moved up an impressive six places in the so-called “Pairwise Comparison Ratings” rankings going into the CCHA semifinals at the Joe Louis Arena in Detroit this weekend. Notre Dame are also currently ranked # 9 by both the USA Today / College Hockey Magazine as well as the USCHO.COM national polls.